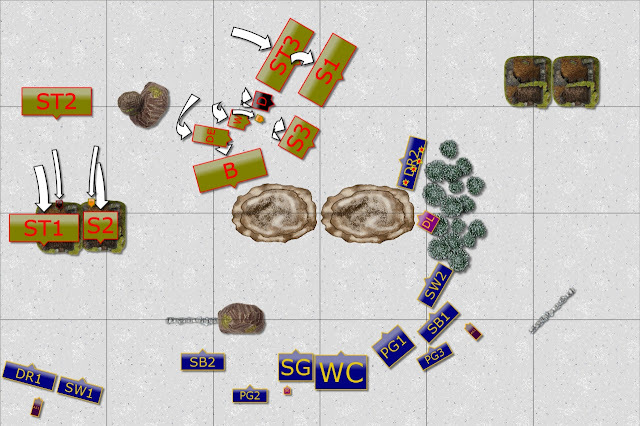 In the game 6 of Australian Clash of Kings I faced vile Ratkin commanded by the veteran Warlord - Clint. He was another member of the merry band of Queenslanders who made it South to Canberra for that event. He is a very active tournament player and it is not a surprise to find out that he was playing at the very first Australian Masters in December. In fact, he is currently Number 1 in the Rankings! 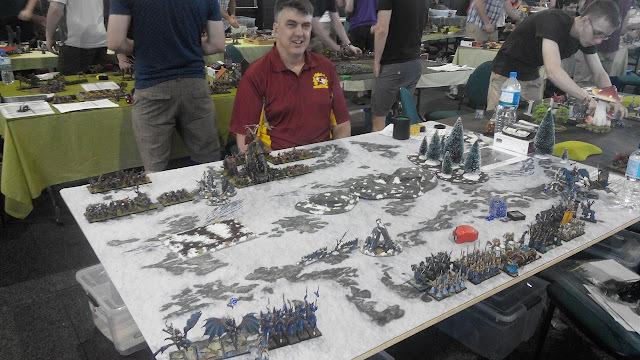 I had a great pleasure to play against a very experienced player (Clint also plays with a variety of armies) and to learn from him during the battle. Clint brought vile Ratkin this time and that posed an additional challenge. Not only I was about to play against currently the best player in Australia but also against the army I have never faced before! 3 x 40 Shock Troops - at first glance they look like average infantry block. Not a great armor, average to hit value, good nerve but nothing extraordinary. However, then one needs to see the special rules. Combination of Elite, CS(1) and Vicious mean that they will hit more often than one expects and do even more damage per hit. Due to army wide Rally(1) as long as there is another units nearby they will also improve their nerve. I was quite interested to see how that works in practice. 40 Blight - I had an impression that when Shock Troops are the ones that can deal damage, then Blight is more of a defense unit. First, they don't waver, which is already great. Second, they have Ensnare rule too that makes them harder to hit. Excellent combination with the protection of the terrain. Same can be said about Stealthy. Despite having little armor it is difficult to hit them. But with 30 attacks and CS(1) due to artifact then can hit back reliably as well so maybe they are a bit more flexible than I initially thought! Death Engine - very interesting and versatile element of the army. It looks like a war engine but is classified as a Monster. A bit of random in the number of attacks but it starts from 8 which is already a good number. With the "Vile Sorcery" upgrade it can happily roll after infantry line and keep blasting things without penalties for cover. And when the time is right it can get into melee comfortably. Another great thing is that it cannot be wavered and goof 5+ defense. Another very reliable and flexible element! What can be potentially used against it is its wider flank. But that is not a huge weakness among all these advantages. 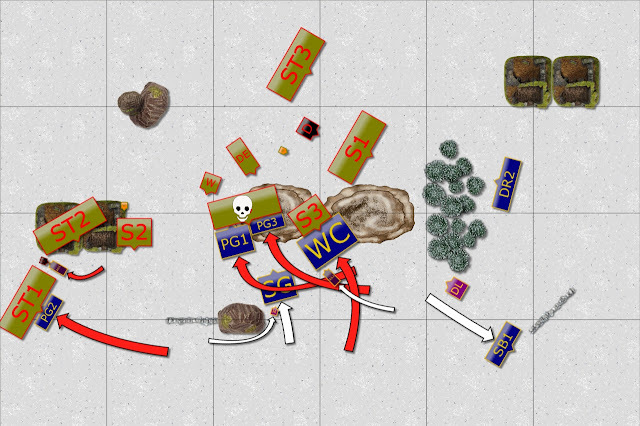 Weapon Team - flexible shooters thanks to Nimble rule and Piercing (1) on its Breath Attacks. It means it has an effective range of 18" and that makes it difficult to avoid. At the same time it can be hidden behind the units and even if spotted, not easily accessible to shoot at or attack in melee. I expected that in order to get it I would need to remove something bigger in front of it first. Daemonspawn - quite an expensive model but very flexible. It inspires and provides Rally(2) meaning units around it are very reliable. It can cast lightning (5) as the whole army advances but has a very good melee capabilities too. Very good nerve and defense mean it cannot be easily destroyed either and suspected that among this sea of rats there will be little space to attack it anyway. Warlocks - more sources of Lightnings, especially with the Artifact. That would make me a bit shy in advancing as each one of the Warlocks, Daemonspawn, Death Engine or Weapon Team has a potential to waver and rout my small units. Enforcer - last but not least hero in the army. Somehow I assumed he is another source of inspire but he is the fighting hero instead. Cheap but useful and another source of Rally(1). I have not noticed that in the first place but this army has only one model with Inspire and relies on multiple Rally sources instead. 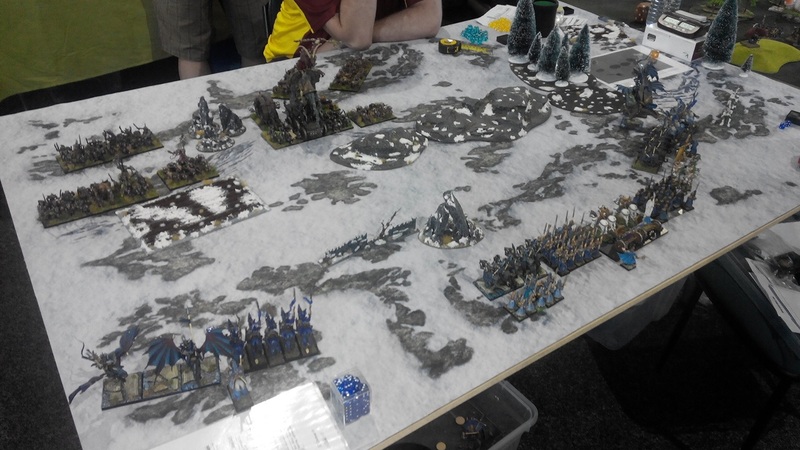 It was difficult for me to judge if that army would advance to flood my lines with rats or would it castle up and use the lightnings to do damage. It looked to me it could do both! We were playing Control scenario and I assumed that Clint will deploy with the strong center but would spread his army to cover all paths. With his wide frontage of the hordes it was easy to do. I wanted to do the same because that also supported speed and maneuverability of the army. And the assumption was that I will try to keep enemy in their half to try and push on the flanks. 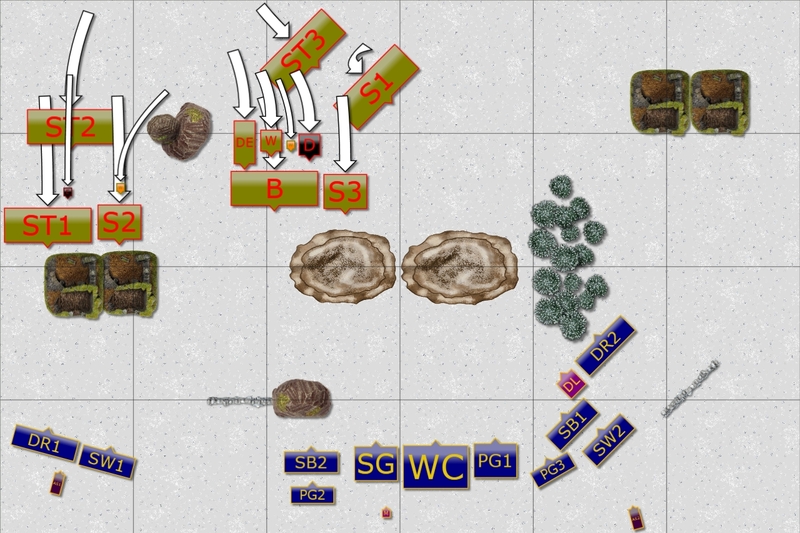 As long as I could succeed in holding the center and win one flank I should win on the scenario. However, it was clear that Clint had a different plan. He gave up my right to focus on left and center. That suggested he intended to control 4 out of 6 regions but by pushing into my half he would aim to win by getting extra points for the middle square in my territory. This approach had such advantage that allowed him form in two lines, thus preventing fliers to land behind the army. In addition allowed to move forward at a good speed while being able to control the back yard for the scenario purpose. 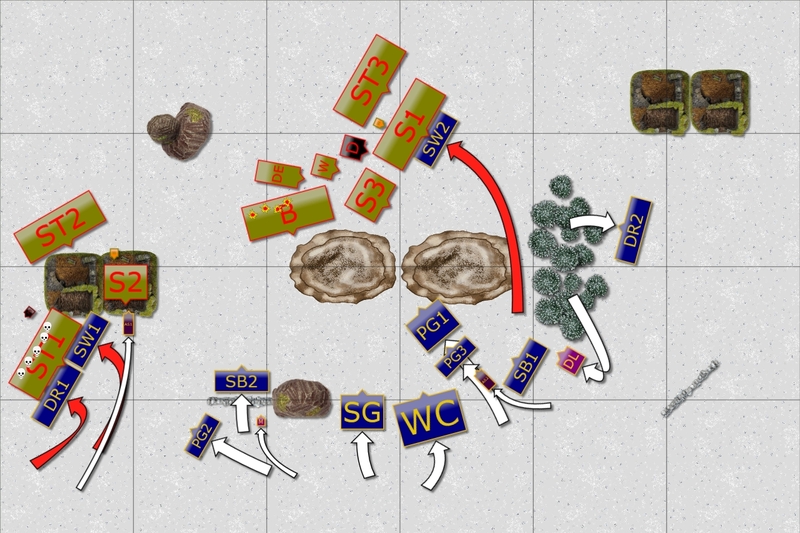 As you can see I didn't come up with a good plan to counter that in the deployment as I pretty much did what I planned to do before the battle. However, I decided that in this case the center will still try to hold and push back invaders. 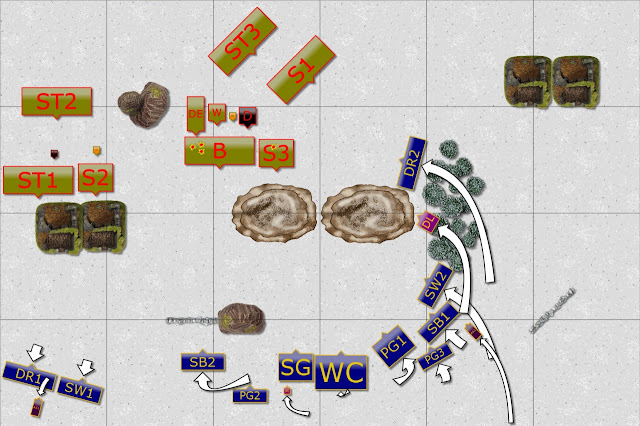 The left flank will try to slow down the advance of the Shock Troops while right flank will control the two zones on the side. If there is an opportunity to jump over, I would be able to outflank the enemy with the attack through the center. It happened that I got the first turn in this game. Shy advance on the right. A bit of movement, not much else. Although the enemy was still far away, Elves moved only a little. 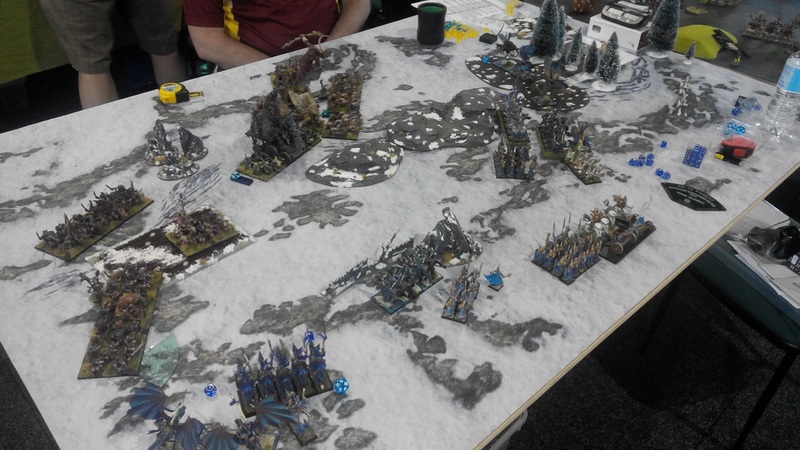 It was to avoid the Lightnings but as a result kept Elven shooters out of range too. The opening of the battle was quite uneventful. Ratkin army moves at a double. 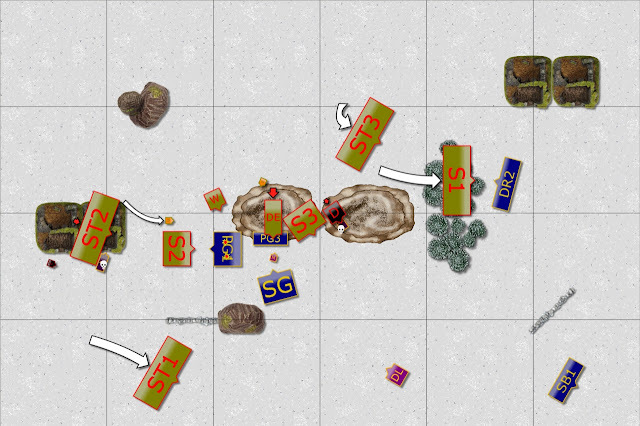 Ratkin could afford to move at a double thanks to the clever double line formation. The terrain also provided some protection, either from the shooting or from the early charges of the fast Elven units. The units on the left flank pulled back to avoid the ranged attacks of the Ratkin while the right flank continued the advance. 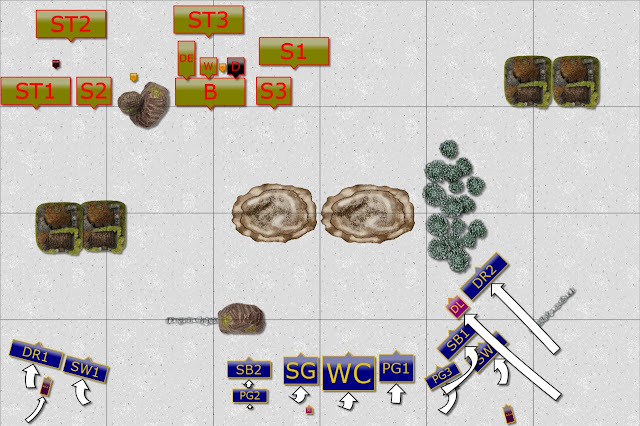 The units in the center started shooting but they could not coordinate well and the combination of terrain and poisonous gases around the Blight horde limited the effectiveness further. First Lightnings hit the drakons. 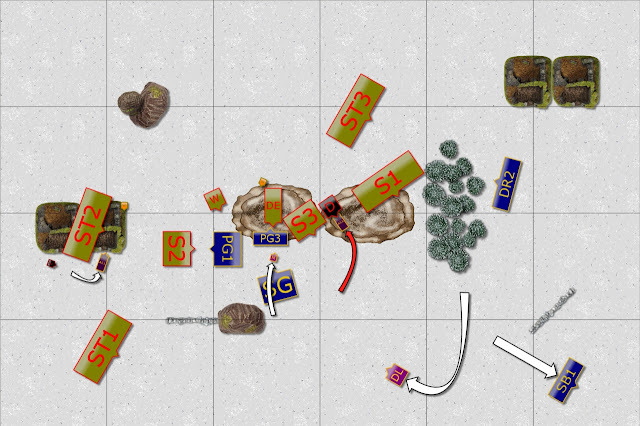 The Ratkin continued the advance on the left, although slowed down by the difficult terrain for now. 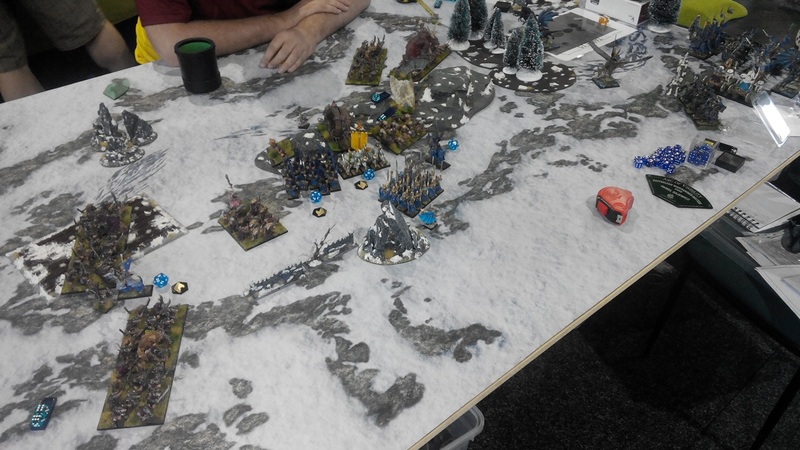 The rest of the army decided not to cross the hills line to keep being protected from the Elven shooting. And to address the problem of outflanking force by sending a few well placed Lightnings at the Drakons! Which flank to press forward with? 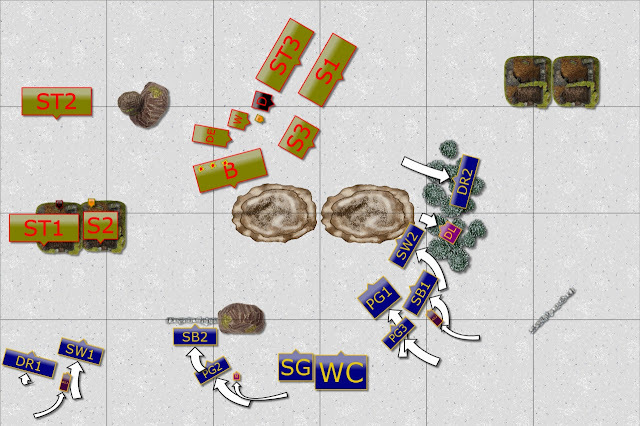 As the Ratkin presented quite tight formation there were no easy ways around it. All the paths were covered and Elves got confused how to fulfill the tactical plans agreed upon before the battle. At this moment they decided to withdraw on the right, move forward on the left and keep shooting at the Blight regardless of the less than ideal conditions. Ratkin press on the left. 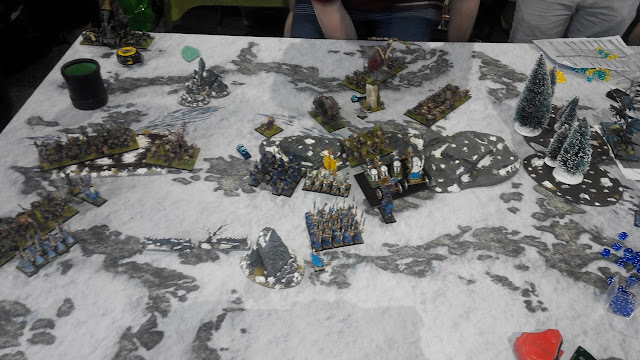 The Shocktroops on the left decided to force some action from the Elves and moved forward to block the passage around. The Warlock finally could use his spell and cast some Lightnings at Storm Wind cavalry. 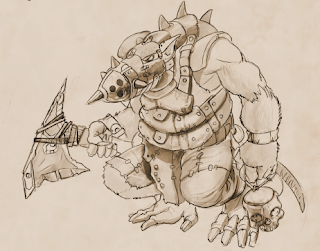 The main body of the Ratkin army still stayed behind the protective line of the hills and kept shooting at the Drakon Riders. Attacks to stall Ratkin advance. 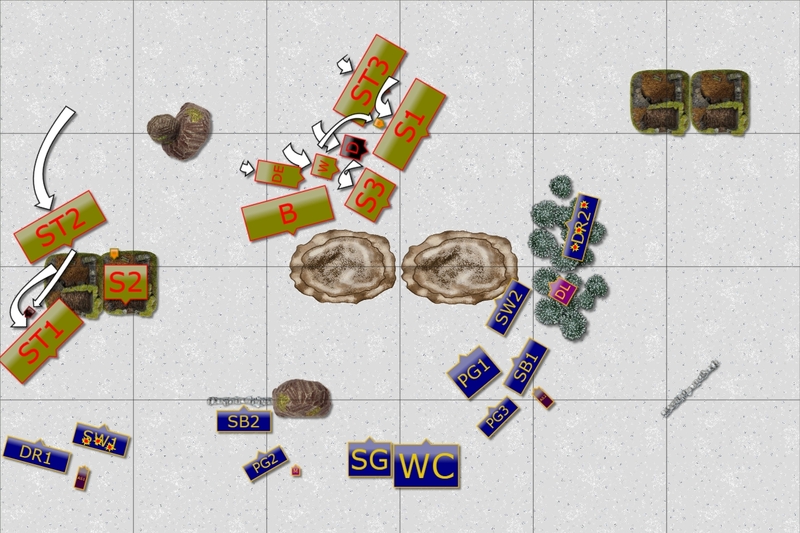 Elven units attack on the left to stop the Ratkin. The Palace Guard is moving in too in order to help with the counter attack. The shooters in the center one more time damage the Blight unit but it is not yet destroyed. On the right Storm Wind charges against the Slaves to block the units behind it and stall the advance on that flank too. Elven cavalry clearly overextended in the attack and now it was time to get punished. On the left both Shock Troops make to the melee, with obedient Slaves moving out of the way. 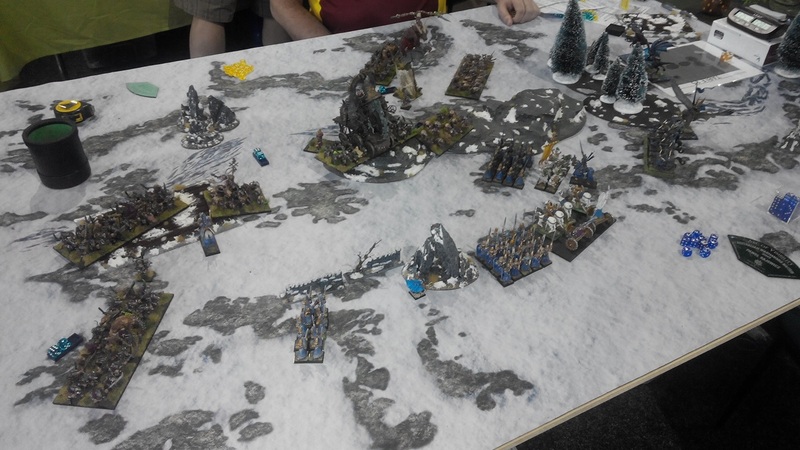 The Weapon Team gets rid of the fast cavalry too, while the Slaves with the help of Deamonspawn clear kill Elven knights blocking their path. The loss of four units was a tough blow for the Elven army but they had to keep fighting in order to have a chance to survive now. 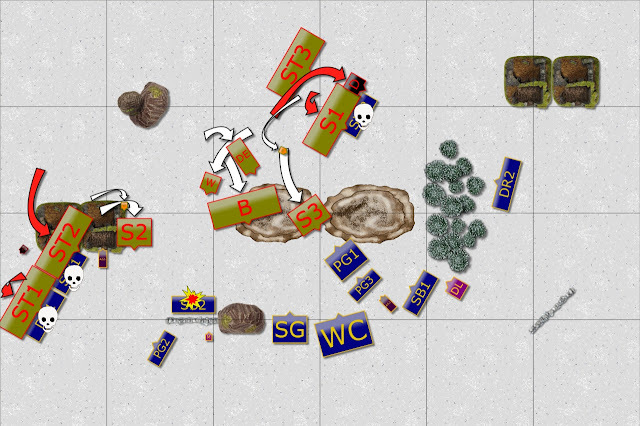 The Palace Guard on the left charged the wounded Shock Troops but their attack was weak and didn't impress the Ratkin. The other two units of the Palace Guard in the center did much better by routing the Blight. Nearby Chariots attacked the Slaves to protect the flank. At the same time fast troops on the right moved to the safe positions to secure control zones. Ratkin army pressed the advantage! Shock troops on the left had no problem in removing yet another obstacle. In the center, the combination of shooting and melee attacks wavers both Palace Guard units and destroys chariots. That is very bad news for Elves who cannot fight back at all! Palace Guard could only reform and the Wizard with nearby Sea Guard tried to shoot at the Weapn Team but could not get rid of them! Would the wavered Elven line hold? 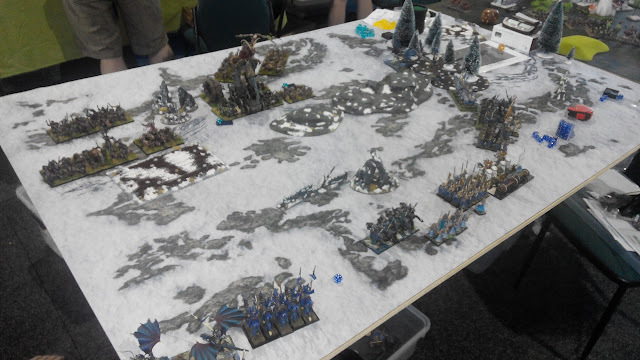 Elves still hold the line! Edit: Forgive me but at this stage I didn't have any more pictures. I believe I was running out of time and the fight was desperate. Unfortunately, without the picture I am not sure if I remember the turn properly so this is what I think happened. Hopefully, if Clint is going to read the report he may recall what exactly happened in the game at this stage. I seem to remember that at this stage his units didn't succeed in destroying my Palace Guard and it was not yet decided who is controlling the center zone of the Elven half. 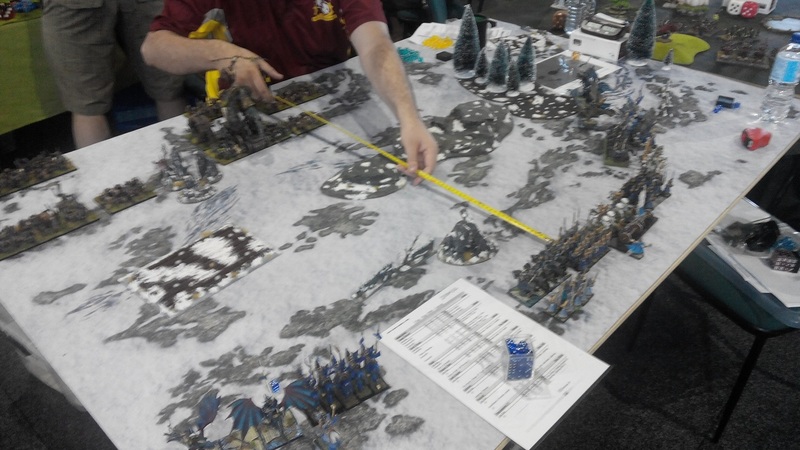 It was also a question if the battle was to go for one more turn and as Clint rolled 4+ it continued to turn 7! Elves knew that their desperate resistance was futile and that they were about to lose the battle completely. The last charges were only to drag some more enemies with them to the other side. Elven lines could not hold against another attack and crumbled, allowing the Ratkin to claim control over the battle field! Congratulations to Clint for a great victory! He had a solid plan, executed it patiently and was rewarded with an undisputed win. He then continued his march to another victory and claimed well deserved overall championship of the first Australian Clash of Kings! Unfortunately, I didn't play well this time and it showed on many levels. I didn't anticipate the way Clint would deploy his forces and my own battle line was not well prepared to deal with his formation. Ideally, I think, I would prefer to have my shooting focused on the left, with support of fliers there. That would allow me to inflict more damage upon Shock Troops and have units read to tackle the second wave too. 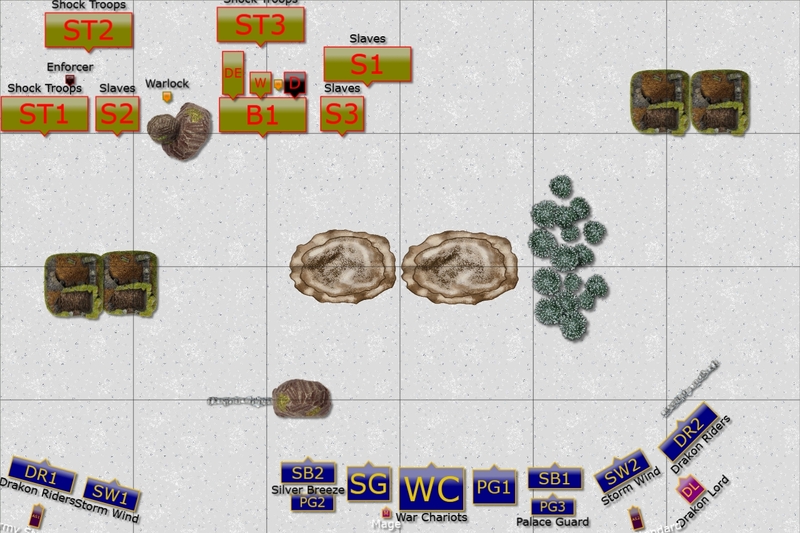 Having fast units ready to take control over the right edge would have been possible to achieve in that setting too. My actions were not coordinated. Even in terms of shooting at the Blight that still helped to eliminate them later, I often either didn't have proper line of sight and was too far. The attacks were done piece meal and no wonder the counter charges destroyed my units completely. But Clint played better and he deserved the chance to prove it. 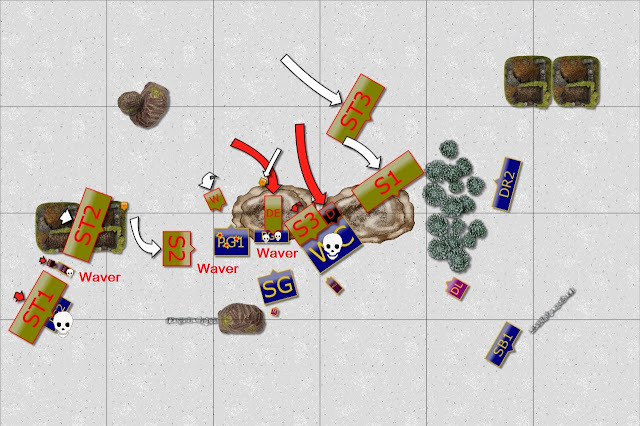 It happened when he rolled the dice for 7th turn and I lost both, the scenario and 3 more units. That further contributed to the large margin of the defeat. I certainly underestimated the power of Shock Troops. With Elite and Vicious they hit hard. 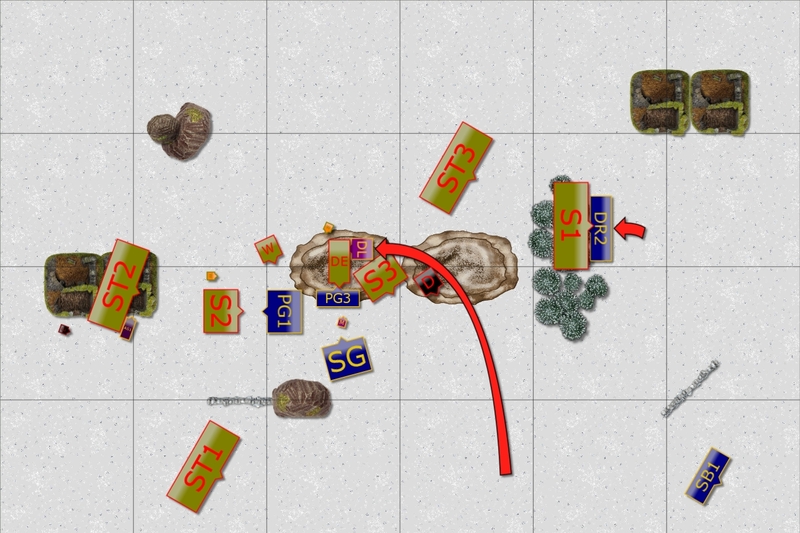 I should have commanded better on that flank, at least in terms of committing to melee later than I did. 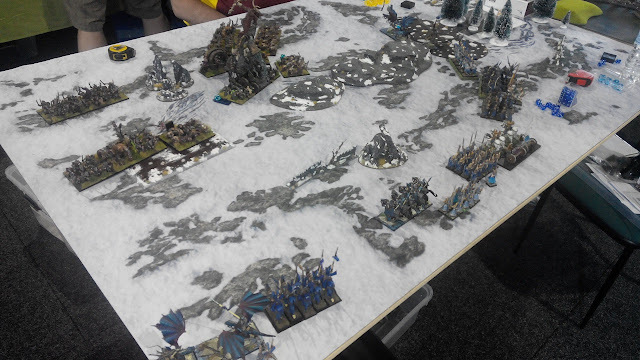 Or, potentially, charge the enemy with Storm Wind alone (so that they were not hindered) and charge again next turn with Drakon Riders and Palace Guard. Maybe that would have at least allowed me to claim that horde before second unit destroyed mine. The wavers in turn 5 were also tough. But I consider these as a consequence of my poor plan and hesitating too much during the game. 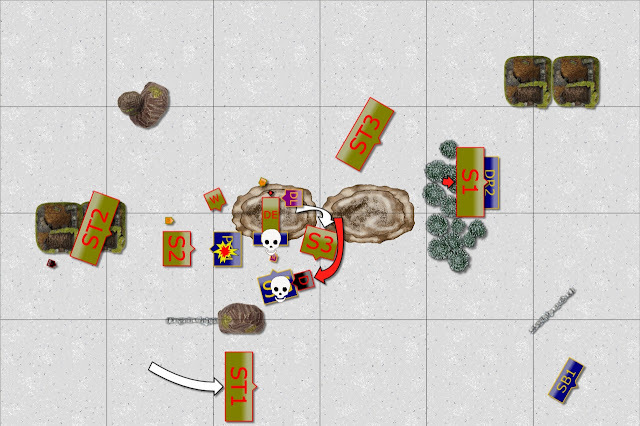 At this stage I didn't have reserves to keep Ratkin in their half so I could not rely on dice rolls to help me here. Hopefully, this defeat will allow me to play better against Ratkin next time! Once again, congratulations to Clint for a victory in this game and overall success at the event! Great game, I can definitely see how he won best overall. 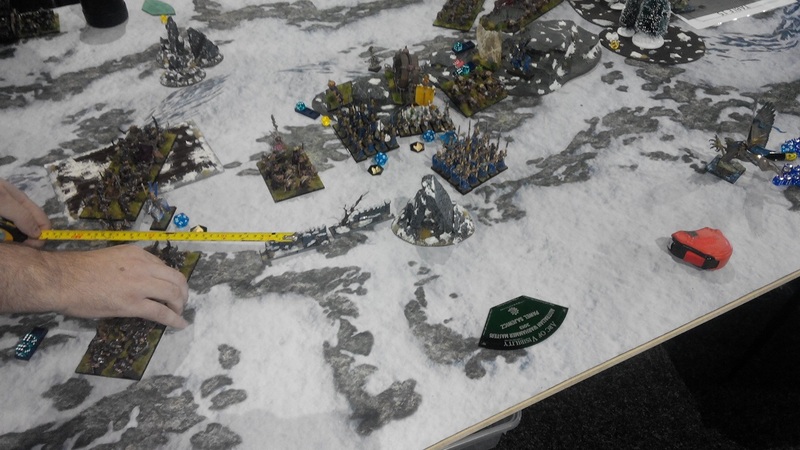 I think skaven present a very difficult challenge for MSU. They are able to match MSU in the amount of drops, and they have access to incredible shooting that can easily waver/rout troop and regiment sized units if focused. And add the rallying rule on top of all of that, and you have a very difficult list to crack. The double battle line and using the sides of the board to prevent flanks and fliers from optimal positions was a brilliant strategy. I definitely learned a lot from this report which is why I enjoy reading them so much! 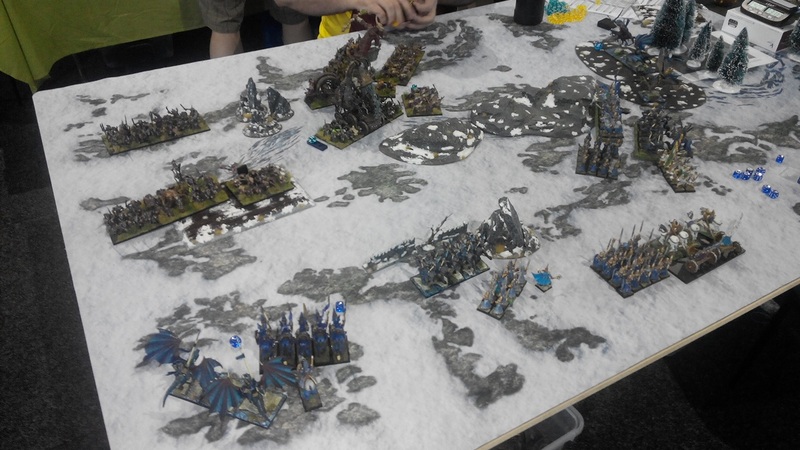 Hopefully you get the chance for a rematch because I would like to see (now that you have had a chance to see skaven on the table) how you would play differently. Thanks again for the incredible reports! I also think I learned a lot and I hope one day we will have a rematch. This game and report have already sparked some ideas but I need to clarify them and test them first to see if they actually are viable.